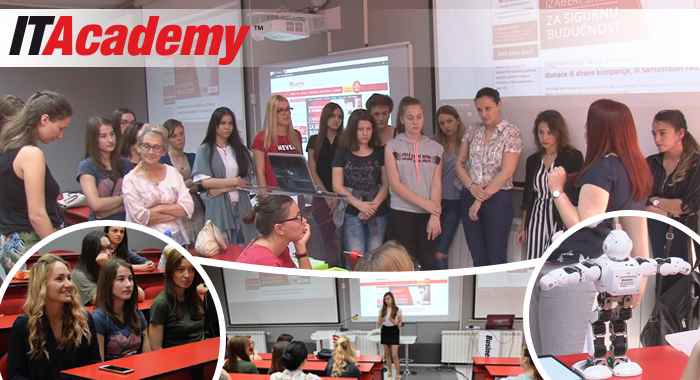 On Saturday, May 26, an IT event took place at ITAcademy which proved that women are an integral part of information technologies. At the event, some of the ladies from the IT sectors of our most successful companies addressed the girls interested in this highly popular area. They shared their experience from both school and work, stating that the prejudice about women not being fit for IT jobs is disappearing. In addition, they stressed that expert research has shown that girls are much needed in this field on account of their creativity, analytical mind and way of thinking. The ladies from the best-known IT companies in Serbia, Holycode, TNation, Relax Gaming and Levi9, concluded that the need for IT experts grows on a daily basis, as does the demand for female perspective in technology. “It is true that in my generation, there were fewer girls interested in IT. I don’t know the reason, but it’s different now. Younger girls are using computers more, and are more interested in the field”, said Milica Ignjatović, a mobile developer at Holycode. The speakers at this IT event were vice-principal of the Information Technology High School (ITHS), a professor at ITS, an ITS student, as well as a lecturer at ITAcademy JUNIOR, who has some interesting thoughts. “At the ITAcademy JUNIOR program, I noticed that the girls are more engaged in the activities, believe it or not; so I think the situation is drastically changing for the better in this respect”, said Slađana Vidojević, lecturer at ITAcademy JUNIOR. “When I enrolled into ITHS, I didn’t know anything about computers. Then I got into it, started learning about the programming languages, and realized this is something that interests me. Now I am an ITS student, and I have progressed significantly. I am already working on some serious and real projects which allow me to gain significant experience and truly realize that IT is an area for me”, said Nadica Žarkić, ITS student. be more women in the field due to an increase in the demand for experts both in the country and abroad. There are many vacancies for girls, who according to the latest research, are more in demand that men. “At this event, we concluded that girls are doing extremely well in IT on account of their analytical and creative nature. I am glad that everyone left the event with a smile on their face, agreeing that IT is an area for girls, who are unfortunately in the minority. The aim of this event was to break the stereotype that IT is designed for men”, said Jelena Minić, marketing manager at LINK group, the parent company of ITAcademy. There’s a growing demand for experts in the information technology industry. Girls are a source of unused talent that can bring significant innovation. Therefore, the future of technological innovation largely depends on them. Also, the girls who opt for a career in IT will not only have a secure job, but a profitable one, as well!